Take care of your winter pelt with Gillette Venus and eos! Gillette Venus Embrace Sensitive Refillable Razor - $14.99 -with 5 closely spaced blades to reduce pressure on each blade and a protective ribbon of moisture with a touch of aloe for a smooth glide - perfect for sensitive skin that usually finds shaving to be an irritating experience! 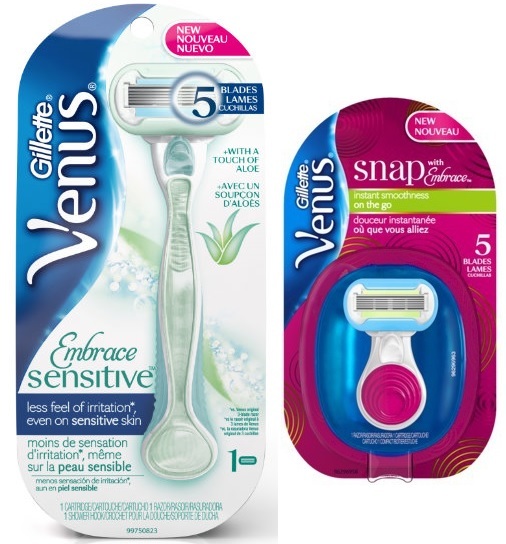 Gillette Venus Snap with Embrace Portable Razor - $11.99 - a 5 blade razor and activated moisture ribbon for instant smoothness on the go with a portable compact design that includes a mini handle that is easy to grip and convenient to store and fits easily in your purse or gym bag! Available now at mass, grocery and drug retailers across Canada. Even for razors that claim you don't need to use cream with them I still do, I think it gives you a closer shave which helps the shave last longer and prevents razor bumps and burn! My fave is this one, especially for the fact that the bottle is plastic, which means it won't rust like metal cans do! eos 24-Hour Moisturizing Shave Cream - 207ml - $3.99 - in 3 fragrances: Lavender Jasmine, Pomegranate Raspberry and Vanilla Bliss with a paraben free formula that is packed with natural conditioning oils, aloe, shea butter, oat and vitamins C & E to keep skin soft, smooth and moisturized for 24 hours, even after rinsing! Available now at Loblaws, Rexall, London Drugs, Jean Coutu, Uniprix and Lawtons.